Saxophonist and music educator Chris Mickel currently resides in his hometown of Charleston, West Virginia. He has been playing saxophone for about 25 years, having studied jazz and classical performance. He is a versatile a musician and has experience performing in many settings from rock and jazz to chamber music and solo classical repertoire. He holds a Doctor of Musical Arts degree from West Virginia University, with his major research project being on the Glazunov saxophone concerto. He earned a Bachelor of Science in Music Education from West Virginia State University in 1999 and a Master of Music in Saxophone Performance from the University of Louisville in 2002. He has studied saxophone with the following teachers: Michael Ibrahim, Morgantown, WV (2008 – 2011); David Wright, Morgantown, WV (2007 – 2008); John Moore, Louisville, KY (2001 – 2002); Michael Tracy, Louisville, KY (2000 – 2001); Gary Stringer, Charleston, WV (1996 – 1999); and Mel Gillespie, Charleston, WV (1992 – 1996). His current musical activities include his private saxophone studio and his work with the C2J2 Quartet based in Charleston, WV. He has recorded two CD's with the C2J2 Quartet: a self‐titled studio recording which is currently available through Kunaki CD distribution and a live recording entitled "Live @ the Glass." He currently has new projects in the works in the form of new studio releases with C2J2 and a classical saxophone recording with pianist Victor Chan. 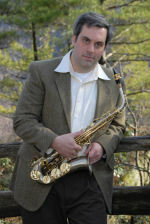 Some of his notable performances are: Participation in various concerts with the West Virginia Symphony Orchestra; performed as a soloist at the 2009 Region 8 conference of the North American Saxophone Alliance; played the lead tenor saxophone chair in the 2009 Mid‐Atlantic Collegiate Jazz Orchestra; performed as a soloist at the 2009 Conference for the Society for Electro‐Acoustic Music in the United States; performed as a soloist at the 2010 National Conference for the North American Saxophone Alliance; performed as featured soloist on faculty recitals and with the Jazz Ensemble at West Virginia State University; performed as featured soloist and accompanist on numerous student recitals and with the West Virginia University Big Band, Little Big Band, Saxophone Quartet, and various other ensembles.